A New Byliner Original by bestselling author Elizabeth Mitchell tells the true story of Neville Bardos, the horse nobody wanted, and his amazing journey to the 2012 Olympic Games. On the eve of the London Games, Elizabeth Mitchell’s new Byliner Original The Fire Horse tells the highly unlikely—and incredibly life-affirming—story of Neville Bardos, a horse that barely survived a terrible barn fire last year, his relationship with his devoted rider, Boyd Martin, and their journey together to the 2012 Olympics. A decade ago, Neville appeared a likely candidate for the glue factory when Australian Boyd Martin saw his potential and bought him for $850, naming him, fittingly, after a notorious local gangster. The two of them worked their way up to the top rankings in the competitive international circuit of three-day eventing, which includes dressage, show jumping, and cross-country. The future was bright. Then, on May 30, 2011, the barn Neville shared with ten other horses caught fire. Knocking out a fireman who was trying to stop him, Martin, wearing flip-flops, ran into the burning barn to find Neville. The horse’s lungs were scorched black, and he faced the fight of his life just to survive. Vets doubted that Neville would make it, and they were sure he’d never compete again. But Martin never gave up on his horse. The Fire Horse chronicles the true story of a friendship between horse and rider, one that is so strong, it has carried them through their respective hard times to the brink of legend. When he began riding Neville, Martin was something of a long shot himself, having once pretended to be an expert on breaking horses on the basis of a single book he read on the way to taking his first job as a trainer. But over the next ten years, he and Neville developed a hard-won appreciation for each other, and after Martin’s father died and the barn fire killed half of his prize horses, it was his relationship with Neville that brought him through those dark days. Boyd Martin would say Neville saved his life. Now they’re in London as members of the U.S. Olympic team. The Equestrian Competition takes place July 28–31. Boyd Martin is a favorite to medal. Neville is his alternate horse and will turn 13 on August 1. Elizabeth Mitchell is the author of the nonfiction books Three Strides Before the Wire: The Dark and Beautiful World of Horse Racing and W.: Revenge of the Bush Dynasty (both from Hyperion). Her bestselling e-singles The Fearless Mrs. Goodwin and Lady with a Past: A Petulant French Sculptor, His Quest for Immortality, and the Real Story of the Statue of Liberty (both from Byliner) are reported historical narratives. Mitchell was executive editor of George magazine and features editor at Spin magazine. She lives in Brooklyn, New York. Byliner publishes compelling works of original fiction and nonfiction written to be read in a single sitting. Among its bestselling titles are Jon Krakauer’s Three Cups of Deceit, Taylor Branch’s The Cartel, Ann Patchett’s The Getaway Car, Amy Tan’s Rules for Virgins, Margaret Atwood’s I’m Starved for You, and Elizabeth Kaye’s Lifeboat No. 8. The companion website, Byliner.com, features curated archives of great fiction and nonfiction writing and allows readers to easily find, share, and buy new and classic stories by their favorite authors. 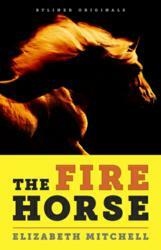 The Fire Horse is available for $1.99 as a Kindle Single at Amazon, a Quick Read at Apple’s iBookstore, and a NOOK Snap at BN.com. For a review copy or to arrange an author interview, please contact Clare Hertel at clare(at)byliner(dot)com; 505-474-6783. In The Fire Horse, Elizabeth Mitchell has crafted far more than a tale about a gifted horse and rider in the world of eventing. This is the heartwarming story about an imperishable bond between a man and his horse—one that began when Boyd Martin acquired a failed racehorse off the track, turned him into an eventing star, and then saved the life of this game and gutsy charge when he was trapped in his burning stall during a terrible stable fire. Neville Bardos’s remarkable comeback under the devoted Martin, as a U.S. Olympic hopeful in the 2012 eventing competition, gives the tale an ending as warm and unlikely as any in equine literature.